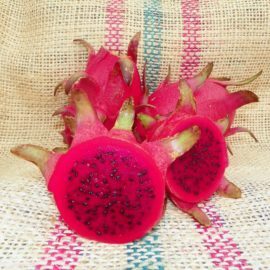 Flavor – When testing for sweetness of the Dragon Fruit a device called a refractometer is used. It uses the brix scale of sweetness. This scale ranges from 0 to 32. The higher the number the sweeter the fruit. In addition to sweetness any unique attributes such as size and flavor are also considered when giving this rating. Fruit Production – For the rating we look at how many fruits are produced from a single plant. Also, how easy or difficult it is to grow is considered. For example, a variety that is self-fertile will get a higher rating than an non self-fertile variety. Growing – This is a rating of the overall hardiness of the plant. In addition to this, we also look at how quickly the plant adapts from cuttings and how long it will take before producing the first fruit. 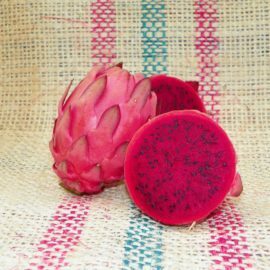 El Grullo is a Dragon Fruit variety that comes from the genus Hylocereus and species ocamponis. This variety originates from El Grullo, Jalisco State Mexico and has an exceptional tolerance to both the heat and cold. It also adapts well to most new conditions. The fruit is a large oval shape with purplish greenish fins on red skin and deep red flesh. The average weight of the fruit is 1 pound. The fruit has a nice sweetness with an average Brix rating of 18. Our first fruit was small and because of this it rating was 14.5. 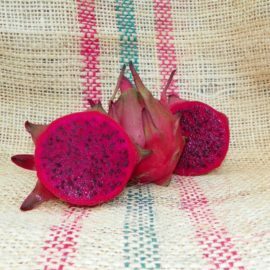 Although the fruit has a nice sweetness it also have a beet-like flavor. The flowers of El Grullo are night blooming that have white petals and deep red and yellow calyx (outer peddles). Stems are thick, heavy, three-sided with large sized thorns. The mature stems turn grayish like most Hylocereus ocamponis. 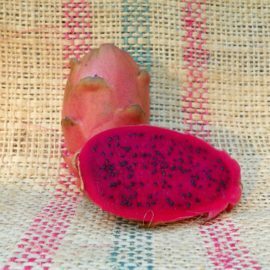 This color allows the plant to tolerate heat and cold much better than other species of Hylocereus. This variety was acquired from a grower in California.